About a year ago, Wegmans began including gluten-free Kikkoman soy sauce packets with all of its sushi. 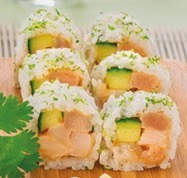 However, several varieties of sushi were still made with gluten-containing ingredients. That's no longer the case today. The chain says that all of its sushi and sashimi are now made with ingredients that do not contain gluten. Wegmans is careful to note that these prepared foods are considered "made with no gluten-containing ingredients" rather than "gluten free." In a comment posted at the Wegmans blog, Valerie Fox, a Wegmans Consumer Affairs media specialist, says that "prepared foods are made in our stores and do not come in sealed packages, so there is the risk of cross-contact. We’ve analyzed the recipes and ingredient lists for our prepared foods carefully, but we’re being honest about a risk of cross-contact in a supermarket setting. We know that some customers are comfortable with that risk in prepared foods and others are not." For example, the shrimp tempura rolls are now made with a deep-fried gluten-free batter but may be prepared in a fryer that also prepares non-gluten-free items. Check with your local Wegmans to inquire about the store's sushi preparation, as it may vary by location. Wegmans has added a number of new sushi varieties that include a Margarita Roll, made with Kampachi and bay scallops marinated with chili and fresh lime in a pineapple-habañero wrap, and a Kale-elujah! Roll, which combines sesame-marinated kale, green beans, carrot and brown rice with red quinoa, ground flaxseed and chia seed.